Today is Wednesday which means the weekend is in sight! For some kids in the area, this is the weekend before their last full week of summer. So, make it count! There is a lot out there to do, so check out our picks! ROAD TRIP IDEA--Illinois State Fair will be on in Springfield from August 7-17! Check website for more info! 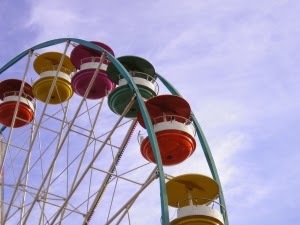 ROAD TRIP IDEA--The Wisconsin State Fair in Milwaukee runs through August 10. For more info check our Milwaukee post. National Night Out Barrington will be held downtown in Barrington from 6:30PM-8:30PM. The evening is also "Public Safety" cruise night. Enjoy a trackless train, be fitted for a bike helmet and watch a K-9 demo. There also will be a free cookout with hot dogs and hamburgers, raffles and more for free! This weekend is a big one in Arlington Heights with the Mane Event and Taste of Arlington Heights. The Mane Event is on August 8 with live entertainment, kids fun, local food vendors, a business expo and more. August 9 is the Taste of Arlington with live entertainment, local food vendors and more. Free admission to both! Check website for more info. Join Step Forward Therapy for a Sensory Event on the Black Top at Windsor School in Arlington Heights. The event runs 10AM-12PM and costs $8 per child if you preregister, $10 day of. There are different rates for more children. Those under 2 and parents are free. Read post for more info. Have high-flying fun Saturday and Sunday at the Kite Festival at the Chicago Botanic Garden in Glencoe from 10AM-3PM. There will be kite flying demos and kite making workshops. The Chicago Fire Kite Team will be preforming. Parking is $25 per car and admission is free. Take in the arts at Art at the Glen Saturday and Sunday at The Glen Town Center in Glenview from 11AM-6PM. The fun will include art, kids activities and musical entertainment. Admission is free! Saturday and Sunday bring Veggie Fest to the Science of Spirituality Center in Naperville from 11AM-8PM each day. The fest will have food demos, a food court, speakers, kids activities, a family meditation tent and more. Admission and parking are free! Deer Park Town Center in Kildeer is holding its Jazz Patio event from 1:30PM-8:00PM. Enjoy jazz, enter raffles and take advantage of special deals. Free admission! Like spending your evenings looking at the stars? The Vera Meineke Nature Center at Spring Valley in Schaumburg is having a Free Star Gazing Party Saturday from 8:30PM-11:00PM. Telescopes will be set up and there will be activities inside. Saturday is French Connection Day at Cantigny Park in Wheaton from 9AM-3PM. There will be a French open air market, wine tasting, kids activities, street performers and a French yard game. Parking is $5 per car, admission is free. Sunday Funday at Twin Lakes in Palatine from 11AM-3PM will include free family fun, music, boat races and more! Get out your kites for Kite Fest at Berens Park in Elmhurst from 11AM-4PM. There will be kite demos, family kite flying times, kids kite building for free--bring your kites for free fly time!